HERE A SCRAP, THERE A SCRAP, EVERYWHERE A SCRAP HAPPENING! Welcome to my little piece of real estate here in our beloved Scrapland, the land of ... SCRAP and FREEBIES of course!!! Today, I am taking you on a NEW adventure with me! Are you ready??? Of course you are! Hang on tight as I have LOTS to share as I begin to settle into my NEW designing home! And where might that be you ask? 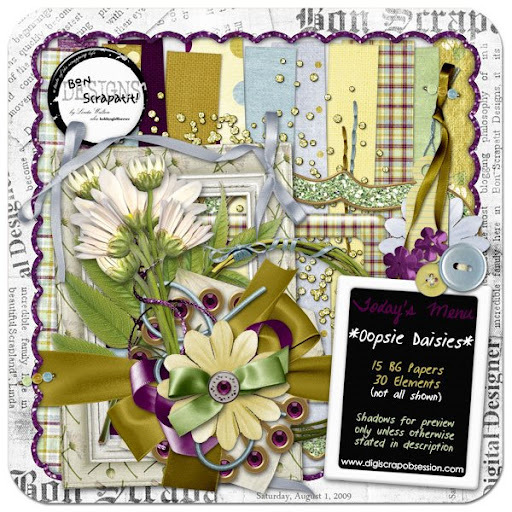 DIGI SCRAP OBSESSION!!! What a GREAT name for the digital scrapbooking addict, eh? ROFL! YUP, and it is also a site FULL of WONDERFULLY awesome people! I have been quiet the past week as I adapt to my new home and get to know those that I shall be working closely with! I am SO blessed to have been accepted as a DSO designer and look forward to continuing to follow my passion with y'all via my blog and now, DSO!!! WOOT! I know that MANY of you are already members, as I have been for several months now while participating in Kim B's AWESOME monthly Colour Challenge! By the way, I won't be participating THIS month as my plate is FULL and I have a VERY busy month ahead here at home with family events, so I'm sort of taking a vacation for the FIRST time in MY personal Scrapland history!!! LOL! Firstly, one of my NEW designer colleagues is the MAGNIFICENT Ms. Charlie of CHARLIE'S DIGISCRAPS! Charlie and I have known each other for some time now and this is our FIRST opportunity to work together and DSO is where she began designing by participating in Kim's CC! WELCOME HOME Charlie!!! 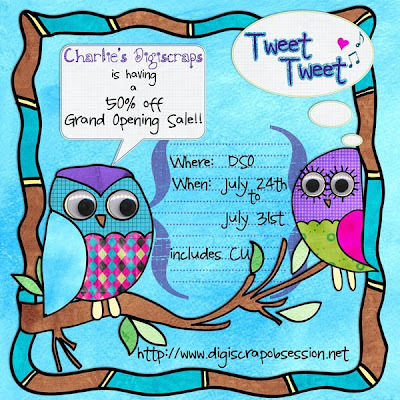 Please join me in welcoming Charlie to DSO by checking out her GRAND OPENING SALE going on now through July 31st!!! Click the IMAGE below to be transported to Charlie's store at DSO and stock up while she has EVERYTHING (including CU) on sale for 50% off in celebration of her homecoming! Thank you for sharing SO generously with ALL of us Charlie! You ROCK girlie! 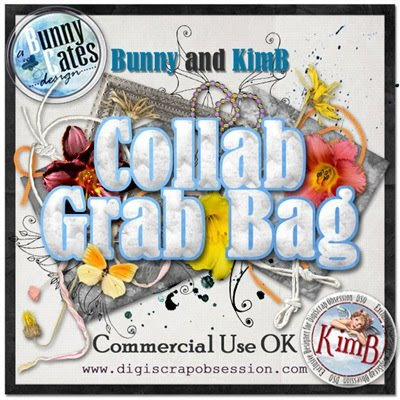 And while you are at Charlie's new store, you might wish to hop on over to Kim and Bunny's to snag their BRAND NEW collaboration GRAB BAG, packed with CU goodness! YUP, you just KNOW that I've snagged it already and it is chock-full of LOTS of useful goodies whether you be a designer or a scrapper! 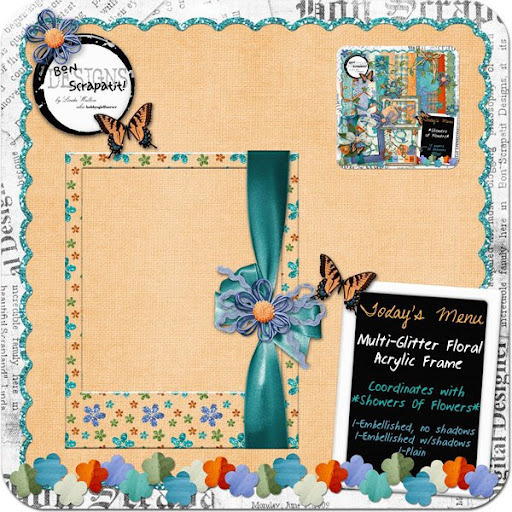 If you wish to take a PEEK at some of the LOVELY items in Kim and Bunny's collaboration, click HERE to be transported to Kim's blog where she has LOTS of EYE CANDY and some FREE goodies to boot! THANK YOU girlfriend for ALL that you and your AWESOME CT share with us! MWAH! Click image below to be transported to DSO where you can purchase Kim and Bunny's INCREDIBLE grab bag for ONLY $8.00 this week! WOO HOO! 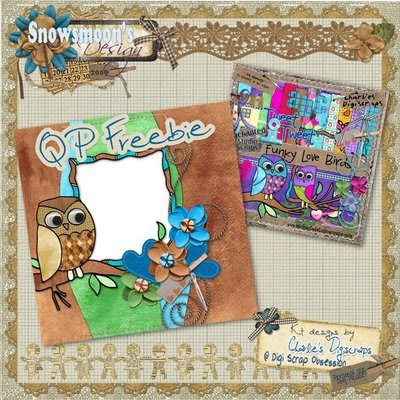 My BFF, Dawn, has a HOOT of a quickpage for you on her blog using Charlie's, *Funky Love Birds*! TOO darned cute! Click the IMAGE below to be transported to Dawn's blog to download her quickpage! Please leave everybody some SCRAPLAND LOVE for me! This week is also VERY special to me for yet ANOTHER reason! 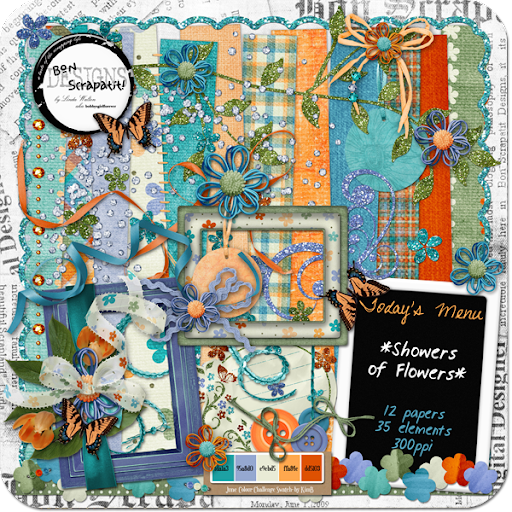 This week I am the SPOTLIGHT DESIGNER over at F.O.R.E.V.E.R Freebies hosted by the SWEET and TALENTED Brandy aka Mega Doodle Inspired! And what exactly does this mean? A FREE kit for y'all from ME this week!!! Yes, that is another reason why I've been SO quiet!!! LOL! 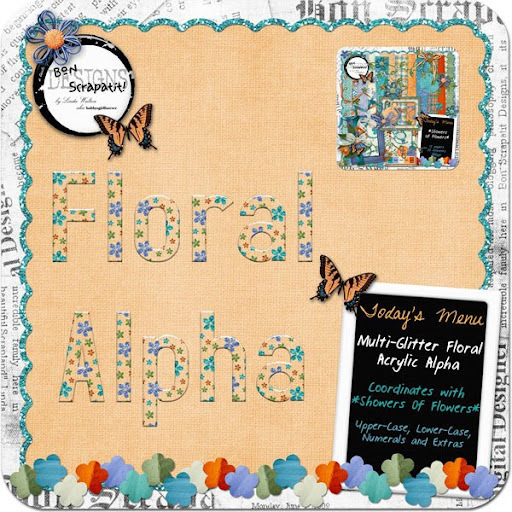 I will also have a coordinating alpha posted for y'all later this week, so STAY-TUNED! I will catch y'all up on what is happening on the home front that will be keeping me VERY busy the month of August! Thanks for stopping by to visit and a VERY special thank you to those of you checking up on me! You are SOOOO sweet and I LOVE you! Have a MAGNIFICENT and SCRAP HAPPY day y'all! Y'ALL HAVE BEEN FRAMED - GLITTERALLY! ROFL! Does that give you an idea of the silly mood I am in this afternoon? ROFL! Robert and I stayed up until 5:00 am this morning listening to 50's and 60's music on XM radio, our satellite music station! It has been blistering HOT here the past week and sometimes the heat gets to you and you relish the EARLY morning hours of the day when you can go about your housework and such without breaking out into a sweat! LOL! Shoot, I even got up out of my computer chair and danced around a bit! That counts for aerobics, right??? Uh, huh, you bet it does!!! Robert just checked our thermometer on the deck a bit ago and it read 103 degrees at 11:30 am this morning! SO much for the meteorologists reporting the beginning of a cool down to the 90's today! ROFL! It is actually HOTTER today than the past few days! If our deck thermometer reads 103 degrees, that means it is usually anywhere from 5-8 degrees hotter in the sun! OOOOPS, we just checked again and it is DOWN to 101 degrees on the deck!!! WOO HOO! *hint of sarcasm* We have developed overcast which appears to be responsible for the WEE bit of cooling! HA, HA! Oh, a quick update on my "gluten intolerance"! I think that is my major trouble at the moment as I've now gone gluten-free for the past five days or so and I am feeling a HUGE relief in the reduction of bloating that had been going clear up to my breast bone. I've had a pretty good increase in my energy levels as a result, which may just account for the outbreak of dancing the wee hours of this morning! He, he ... I am also doing a series of cleanses. I shall keep y'all "abreast" of my progress! ROFL! Hope this finds y'all relaxing and enjoying the last day of this BEAUTIFUL weekend and ready to take on what the week ahead holds for you - may it be AWESOME! P.S. I was TOTALLY overwhelmed with ALL of the love for the glittered alpha! THANK YOU! MY BABIES TURN *20* AND A GIFT FOR Y'ALL! It's LATER and I'm baaaaaaaaaaack!!! I TOTALLY forgot it was my babies' birthday yesterday after leaving that last post, so I apologize for the LONG span of time between then and NOW! Firstly, thank you SOOOOO much for the LOVELY thank you's and comments. My low-energy levels are SUPER charged when I read your kind words! MWAH! Well, can you believe it was TWO decades ago that I gave birth to DOUBLE-BLESSINGS after thinking we were finished growing our family! HA! As my oldest daughter declared after we got up the nerve to share the news of being pregnant again, "Mom, you and dad can make all the plans you want, but God has the final say so!" ROFL! Talk about some incredible wisdom at the wise-old age of 10!!! She is just as sharp and savvy today as she was 20 years ago! Love you sweetheart! While I realize that "we" do the training up of our children, I also believe that we learn just as much from them as they do from us! As I recently mentioned in a bio I wrote, I have had LOTS and LOTS of patience worked out in me! Our children remind us of the MOST important things in life, as well as just HOW easy it is to get up once we've fallen! Let me tell you, I've had to pick myself up and carry on MANY a time over the years. After all, if my children can do it, then why not I? LOL! Our children are also great teachers of "unconditional love"! No matter how many times we've scolded them, taken away their privileges, not allowed them to do something that they REALLY, REALLY wished to do, or how we may have unintentionally embarrassed them in front of their friends (and so on and so forth), they STILL love us! YUP, our children, in their innocence, are AMAZING teachers of how we, as adults, should handle our relationships, don't you think? Okay, minus the kicking, biting, scratching and hair-pulling! ROFL! Children easily forgive even after the aforementioned! Enough of my rambling, I would like to share a couple of photos that I quickly dug out, while teary-eyed in the memories of the birth of Luke Odell and John Craig. Y'all have seen a more recent photo of them in some of the wedding photos from my daughter, Joan's wedding, so I am just posting a couple of baby pics! HAPPY BIRTHDAY MY SONS! I am SO proud to be called, Mother, Mom and even on occasion, MOM! LOL! May the year ahead help you to find MUCH love, joy, peace and happiness! I LOVE YOU! 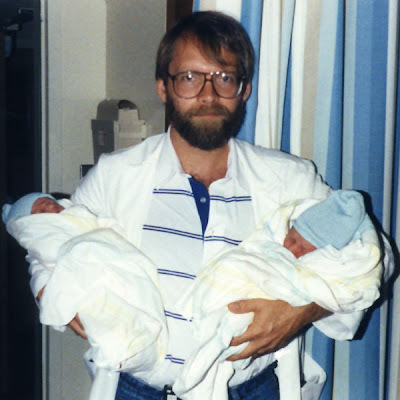 Luke and John were born July 16, 1989 at 4:54 am and 5:03 am, respectively. all of the BLUE in this photo? It's like blue to the sixth power! ROFL! When I have time I will probably turn the background black and white. head-down position for the entire last trimester, which made for a VERY easy delivery! 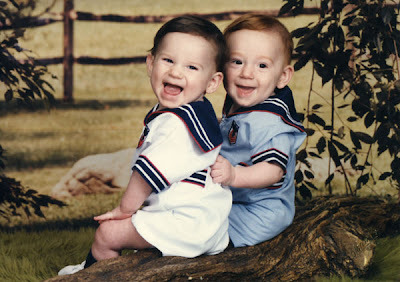 This has always been amongst my VERY favorite baby photos of my twin boys. and John, the brunette! My babies are ALL grown up now! And here you have it! I hope y'all like this one. I spent hours trying to perfect the shadowing on the acrylic so it looks as realistic as I know how to get it at this time! Sort of like the acrylic frames I gave out a while back, so that you don't have to worry about trying to shadow them without darkening the acrylic too. Let me know what you think and if y'all are liking it, I just might have a matching frame or two for you over the weekend!!! Thanks again for ALL of your support! Y'all ROCK! Have a GOOD one y'all and keep on scrapping!!! I will be back later on with a goody for you, but just had to jump in real quick to bring to your attention a MOST incredible offer from Aneta Branch aka SWEETMADE!!! Aneta is offering to the FIRST 20 (possibly 30) people to subscribe, a $20/month membership that entitles us to everything PU and CU in her personal store!!! I have just subscribed as I have LONG admired Aneta's work and have not always been able to afford to buy, so this is an opportunity that I simply could NOT pass on!!! NO CHATTER AND A FREEBIE!!! HUH? I have LOTS to do the next few weeks, so I'll peek in now and then with a goody for y'all and some shares from others! Have a GORGEOUS week y'all and may it be ALL that you hope it to be! MWAH! OMGosh!!! I am like TOTALLY having a hard time keeping my news under wraps, I mean SQUIGGLY and WIGGLY is just the half of it I tell ya!!! Be still my heart - LOL! WOW! I still sit here AMAZED at all of the LOVLEY comments y'all are leaving and I just have to say, THANK YOU! You have lifted my spirits and given me some MUCH needed motivation! You know how it goes, things distract you or maybe you are not feeling well for a spell and then before you know it, your MOJO has flown to Acapulco on vacation and left YOU behind to hold down what's left of the "fort" aka the brain! ROFL! He, he ... SO, I thank you all for finding my MOJO and sending it back to me! This week has just been FILLED with surprises for me thus far and I am going to share one of them with you right now! Jazzy, aka Words That Delite, sent me an e-mail with a layout that she created with a few items from *Showers Of Flowers* as well as *Camping Out* by the INFAMOUS Kim B and after I about died and was then revived, I felt so TOTALLY honored to be sitting along side of BOTH Jazzy and Kim! They both ROCK big time. 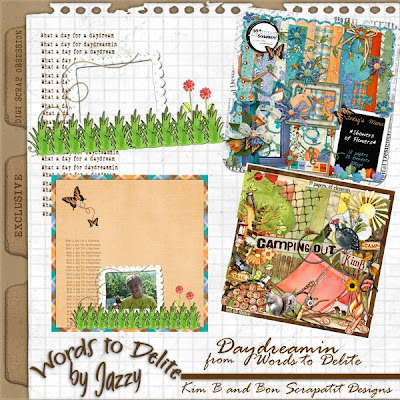 If you've not had the pleasure of being "delited" by Jazzys AMAZING word art, take a peek below and then hop on over to her blog to pick up the LOVELY cluster she has awaiting you for your downloading pleasure! Please leave her some FABULOUS Scrapland lovin' for ALL of her generous offerings! TY! CLICK HERE TO BE TRANSPORTED TO JAZZY'S BLOG! Isn't that a DARLING cluster??? I am LOVING that grass- VERY unique from what I've seen about! Thank you Jazzy! 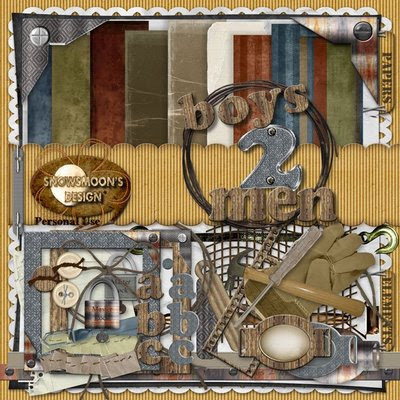 And my DEAREST and BESTEST friend has uploaded more of her ROCKIN' *Boys 2 Men*!!! REMINDER: Make sure to check back for previous parts to this AWESOME scrapkit, which also includes a VERY cool metal alpha! 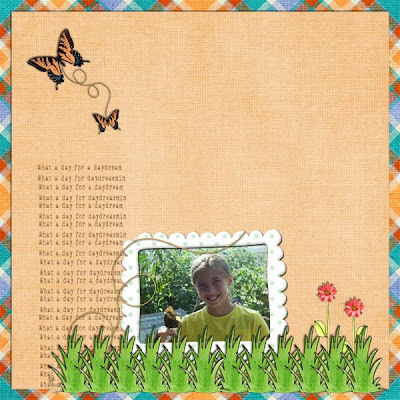 Dawn's "earthy" papers are PERFECT for ANY masculine layout you might be wishing to scrap! Everything will be removed Sunday night. Please leave her some good 'ol Scrapland lovin' - TY! You just HAVE to LOVE all of the MANLY embellies!!! A leather work glove even! Thank you girlfriend! Firstly, before going one sentence further, I wish to THANK YOU from the DEPTHS of my being for your INCREDIBLY positive response to *Showers Of Flowers*! My heart has been melted! MWAH! 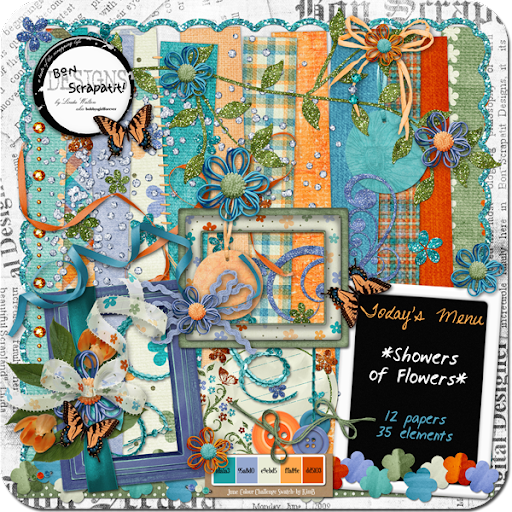 I have divided the embellishments for *Showers Of Flowers* into two days worth of downloading so as to accommodate everyone, but before I leave you with the first set, I would like to share a few goodies with you from two of my designer colleagues! 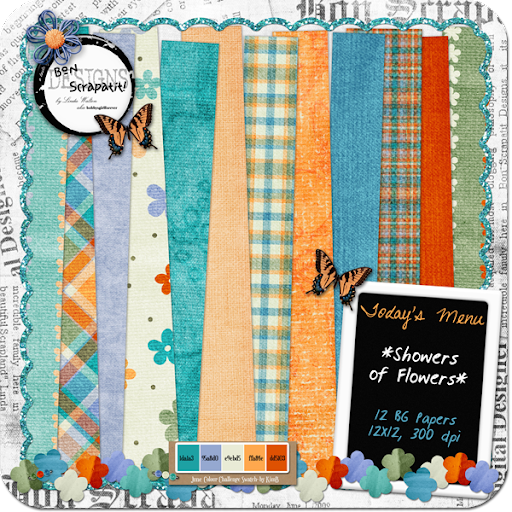 Sarah of Designs By Sassy has another GENEROUS grab bag for sale in her store this month over at Inspiration Lane. Sass ALWAYS packs her bags for unknown destinations! YUP, she NEVER knows where her bags will end up, except for my hard drive as I ask her to share the link to her store as soon as she gets it uploaded! WHY? Because she creates REALLY neato CU stuff (the real flower in *Showers Of Flowers* is one of Sassy's which was photographed by her as well!) and she only charges $3.00 for the ENTIRE collection. Click HERE to see a FULL reveal on her blog and if you decide to purchase, which I hope you will, have LOTS of fun getting creative! OMGosh!!! 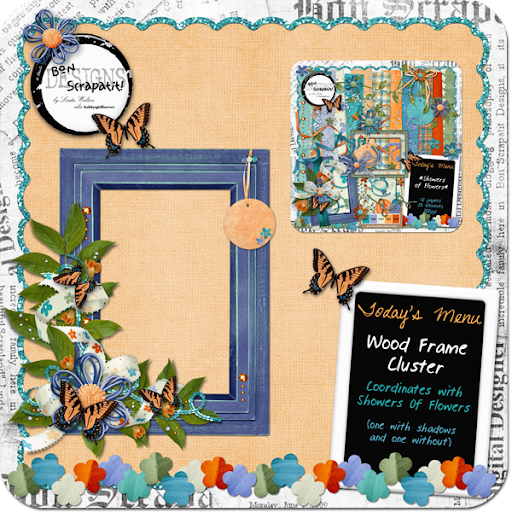 I've just seen a new post on Sassy's blog whilst grabbing her direct link and just HAVE to share this goody with you as well! 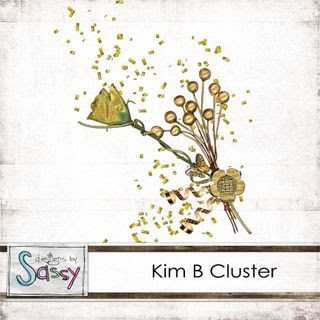 Click the image below to be transported to Sassy's blog to download her Kim B Cluster made from Kim's Mish Mash 4 - Golds! Simply LOVELY Ms. Sarah, thank you! Ms. Dawn aka Snowsmooon's Design has been uploading her *Boys 2 Men* scrapkit and it is CUUUUUUUUUUUUUUUTE!!! So, if you've not been over to collect it all yet, please hop on over and grab it now while it's HOT as it will disappear this weekend! Girlfriend, you ROCKED this kit BIG time - LOVE, LOVE, LOVE it and I thank you SO much! MWAH! Click image below to be transported to Dawn's blog and make sure to go back to the past two posts as well to collect everything - papers, embellies and AND an alpha! I shall see y'all back tomorrow for the final download of embellishments. Wishing you ALL a MOST lovely morning, afternoon or evening! *SHOWERS OF FLOWERS* HAS ARRIVED! Sorry I'm late y'all but I had a few distractions that took me away from the computer for a good portion of the day and I just HAD to get my new preview packing finished so I'm not having to redo things down the road! Okay, without further ado, here is the preview of the entire kit and this morning you will be receiving the background papers. I will be back tomorrow with elements! I am ALMOST there y'all and will start zipping files for the first part of *SHOWERS OF FLOWERS* before noonish PST! 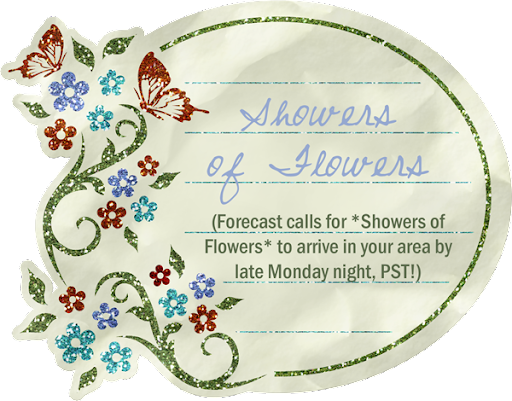 FORECAST IS CALLING FOR *SHOWERS OF FLOWERS*! Hi everyone! Hope my to find all those celebrating the 4th of July yesterday to have had a GRAND time of it wherever or whatever you were doing! As always, I am MOST thankful to those who have sacrificed so that we may continue to live in a country that let's FREEDOM ring! I have to tell you that I've lost my mind and have sat at this computer for days in a row without the ability to focus and my brain just simply locks up, so I just wished to let you know that I still have a kit coming to you for Kim's June Colour Challenge. To give you an idea of just how long my brain has been held hostage during my cleansing which, by the way, means that the product I am using IS doing it's job quite nicely, I have had the papers finished for nearly a week and my brain froze up come embellishment time! AND, I've not even had a clue as to a name for this kit!!! That's a FIRST in my two years of designing! ROFL! EEEEEKS! Help, I've fallen and I WILL get up! I think one just popped in my head!!! OMGosh, how cool is that! See, I just needed to come talk with y'all! I've been missing you something fierce obviously! LOL! Take care, have a FANTASTIC summer week ahead and I shall upload just as soon as I am finished, hopefully before Monday disappears! HA, HA! He, he ... WOO HOO! HAPPY FIRST DAY OF JULY AND HAPPY CANADA DAY!!! Wishing ALL of my Canadian friends a VERY happy CANADA day today!!! I have received my product and have started a cleanse to begin to work on getting my digestive tract back into proper working order and am VERY excited to see where I'm at during the course of the next month! I shall keep you posted and I wish to thank ALL of you who posted in regard to "gluten-intolerance"! Thank you SO much for your feedback, y'all ROCK! I am in a bit of a "fog", which is normal and I've had a difficult time focusing for any length of time, have been gentle with myself and have even been putting myself to bed early! WHOA! Now you just KNOW there's something going on there, eh? ROFL! I have to admit that I actually burned the midnight oil last night but only because I've just GOT to finish my project for Kim B's "JUNE" Colour Challenge over at DSO! I've just heard that she has TWO going on for the month of July! WOO HOO! WOO HOO! Just check out Kim's posting bonuses!!! GORGEOUS as always and a REAL testament to her AMAZING talent! You can either design or create a layout with the designs posted during the month of July to qualify for Kim's posting bonus or if you do both colour swatches, BONUSES!!! Hope to see y'all there! 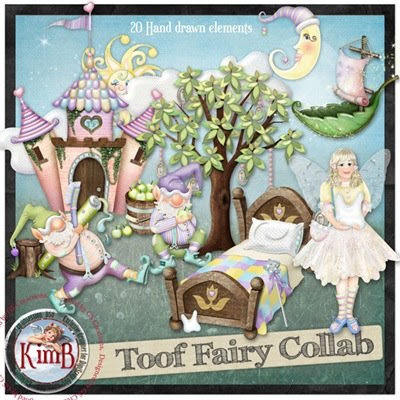 I hope to have my goodies for Kim's June Colour Challenge uploaded for y'all sometime tomorrow. My mind has really been a challenge this past week and I appreciate your patience in awaiting your goodies! Wishing y'all a MOST scrap-happy day!